And yet another great book full of new projects that I'm giving away this Spring! You can check out my review here, and then leave your comment to win this book! Oh wow, that book looks amazing! I alao shared this great giveaway in my FB Crafts group! the book on your blog and for sponsoring the giveaway. Great book, read your review! I would say I am not a beginner but yet I am not experienced either. 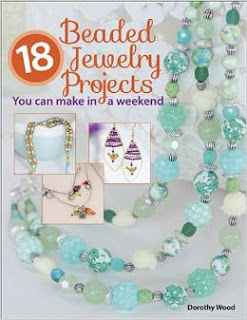 This sounds like a great book for my library to help me with seed beading which I am coming to love! LOVE to have this book. Thanks for the giveaway. Looks like some fun projects. Thank you! Looks like a good book. Looks like there are hours of fun in this book. Thank you for the chance to win a new beading book. I have recently moved and was not able to bring my library with me. I have missed the relaxation beading offers me and I am trying to rebuild my library. This book looks like it contains beautiful new ideas I have not seen.